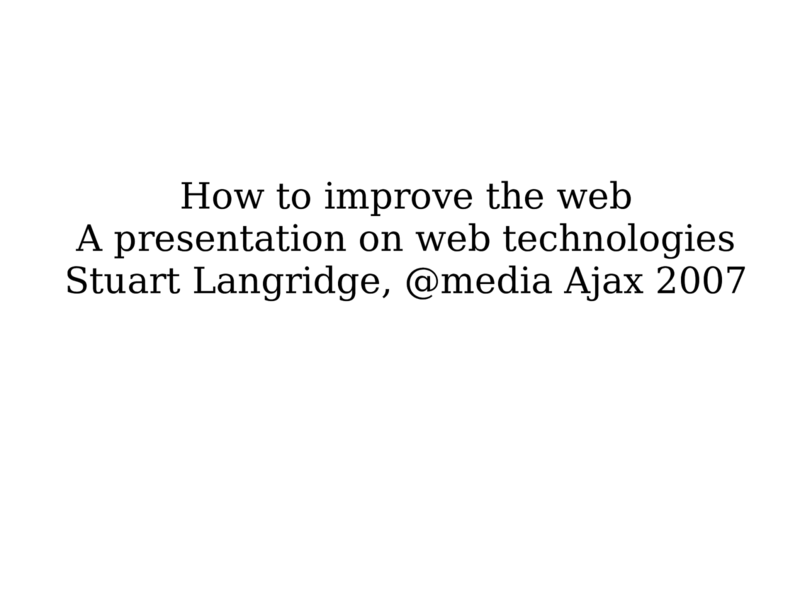 How to improve the web A presentation on web technologies Stuart Langridge, @media Ajax 2007 Today we're going to talk about how to improve the web. NO! How to DESTROY the Web Stuart Langridge, @media Ajax 2007 HOW TO DESTROY THE WEB Me and Satan, manifests as unicorn mouse cursor Spent years evangelising to destroy Developers already working hard: fashing text, banner ads, efects, DHTML popups, IE-only sites You aren't like that. You're professionals. You're ready for the advanced course. We're going to destroy the web together. there are some easy tricks we can try. One of the best is the ---> AJAX LOADING INDICATOR. <img src="http://somewebsite/delete.php?id=54"> or similar on one of your pages and if the user's logged into that website, then it deletes one of their documents! All you have to do to integrate this great new CSRF technology into your web applications is make sure that you don't protect against it! We covered not doing dangerous stuf with GET requests in the Basic course, and Google gave the quest to destroy the web a big leg up when they made the Google Web Accelerator pre- fetch a load of URLs that actually deleted stuf -- nice one, Google, it's great to have you on the team. -->The beauty of the CSRF trick is that it even works with POST! Build non-web things that pretend to be the web but actually require a plugin More important to steal a 2 month bit of competitive advantage now than it is to build a world where everything works for everyone, because we're here to destroy the web. View How To Destroy The Web on Notist. Stuart puts presentations on for free. You can too.